And Satan looks more like Goethe's Mephistopheles. 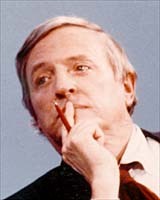 That Milton pose looks suspiciously like William F Buckley. Also, Satan over his right shoulder (where you’d expect the muse or the good angel) and a cane in place of a stout quill pen is very interesting to me.